Gwen Raverat was born Gwendoline Mary Darwin in Cambridge, England, a daughter of Sir George Howard Darwin and his wife Lady Maud du Puy, and a granddaughter of Charles Darwin. She attended the Slade School of Art. 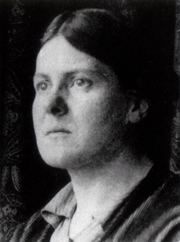 In 1911, she married Jacques Raverat, a French painter, and was active with him in the Bloomsbury Group. They moved to Vence, in the south of France, and had two daughters. In 1928, after her husband's death, she returned to live near Cambridge. She was one of the first modern wood engravers. One of her first wood engravings to appear in a book was Lord Thomas and Fair Annet in The Open Window (1911). She produced one of the first two modern books illustrated with wood engravings, Spring Morning (1915), by her cousin Frances Cornford. Much of her work was done for friends from Cambridge and appeared in books with small editions. The London Mercury also reproduced many of her engravings. She also designed costumes, scenery and program for the theater. Her memoir Period Piece: A Cambridge Childhood, which she illustrated with line drawings, appeared in 1952 and has not been out of print since then. Gwen Raverat is currently considered a "single author." If one or more works are by a distinct, homonymous authors, go ahead and split the author. Gwen Raverat is composed of 8 names. You can examine and separate out names.